Life is like a game of Tetris®. Surprising but true! We need to acknowledge and give ourselves more credit for the valuable skills we use in managing the everyday messy stuff in life. Whilst I’ve never been a fanatic of electronic games, Tetris® has definitely held a degree of fascination for me. There’s something mesmerising about watching the constant trickle of 4-sided blocks floating gently towards the ground, seamlessly slotting into a void, filling the gap with effortless precision to create a smooth, even landscape, so pleasing to the eye and oh so satisfying! But just when you begin to truly relish in your sense of control and power, your skill and dexterity, the blocks begin to fall with ever increasing unpredictability, speed and frequency. The art of slotting individual pieces in to the already established landscape becomes more and more complex with greater demands on the player. The speed of the game combines with skilled technique, lightning quick reflexes and co-ordination, finely tuned problem-solving and decision-making, until it all becomes too much. 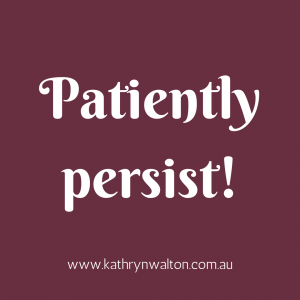 The brain overloads, the fingers go on strike, the eyes stop tracking efficiently, and the body slumps over, head held in hands finding comfort in the curled up foetal position as it relinquishes its task to the too hard basket. Dramatic maybe? Of course! But how much like everyday life is this! With the juggling of tasks, people, places and things over Christmas time, I had a moment of realisation that I was actually playing real life Tetris®. 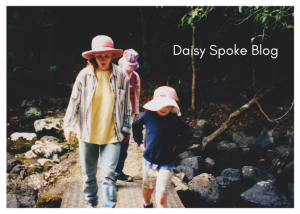 Calmly and smoothly orchestrating meals, bushwalks, visits, and baking sprees. And then another lightbulb went on as I was decluttering. Ding ding! I’m playing real life Tetris® with my cupboards. Shifting A to B and sending C over there so I can bring D back, put half of E here and throw F away. With all these lightbulbs illuminating my life, I decided to learn a bit more about Tetris® to see if it could unlock any hidden secrets for me to successfully bring order to chaos and avoid the inevitable overwhelm. Apparently Tetris® was developed by a Russian game designer Alexey Pajitnov in the 1980’s (* thanks Wikipedia). The name comes from ‘tetra’ referring to 4 sides, combined with ‘tennis’ which was the designer’s favourite sport. Research has suggested that playing Tetris® boosts cognitive functioning such as critical thinking, reasoning, language and processing. 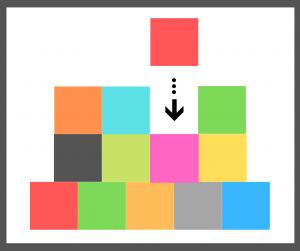 Studies have begun to explore the use of playing Tetris® to help people manage traumatic memories, dieting, smoking, drinking, and even treating “lazy eye”. So assuming these benefits are dinky di, how many benefits might there be when we scale Tetris® up to my real life version? When I struggle with juggling ‘all the things’, how might I have a different experience if I focus on the skills I’m using and expanding? 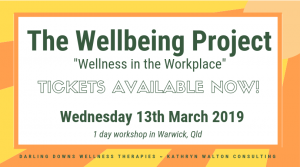 What might be different if I acknowledge that the tedium of everyday life – managing a home, family, community projects and a small business – might actually be honing my skills of precision, co-ordination, mental acuity, recovery, not to mention the aspect of unexpected therapeutic intervention! Is your real life like a game of Tetris® too? Or perhaps it’s more like another game. I’d love to know! Contact me with your thoughts and reflections. PS Perhaps it’s no surprise that I love jig saw puzzles too! How do you spring clean your mind? 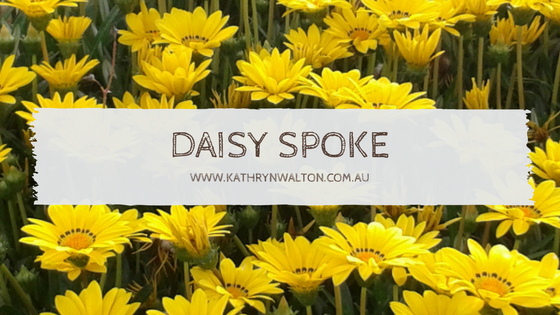 It’s spring at the moment in Australia where I’m sitting at my computer writing this blog post. As I reflect on the very warm day we’ve had, and the cool breeze wafting in through the window, thoughts of spring cleaning come to mind. But, why wait for spring??? Spring cleaning can happen at any time of the year! What a great feeling it is to clean out the house, office or car; throw away, recycle or give away the excess that has accumulated over the past months, year, or more. Spring cleaning offers us a sense of lightness, organisation and order. It gives us renewed energy, like a gentle breeze after a hot day. We’ve swept out the cobwebs and feel fresh and clean again. It’s not just our houses, offices and cars that need regular spring cleaning. Our minds need de-cluttering too, and in my opinion we can all benefit from a little de-cluttering every day. When we organise our thoughts and simplify our lives, our lives run smoother. Spring cleaning our houses is one thing, but how on earth do we go about de-cluttering our minds? One of the best ways to do this is by going for a walk, especially in a green zone. But you might prefer to spend some quiet time in the garden, listen to music, or do some painting. Perhaps you prefer more energetic methods of de-cluttering your mind like running, boxing, swimming or mountain bike riding (a personal favourite!). Consistency and regularity are key! Whatever your choice, remember to be consistent and regular with your actions so that things don’t get on top of you. 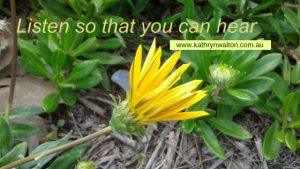 Caring for your mind is just like housework and yard work. When you take regular small steps to clean up and clear out, life seems a whole lot less messy and there is space and energy for the things you value most. Remember …. no matter the season, no matter the weather, you don’t need to wait till spring. Jump into spring cleaning today! 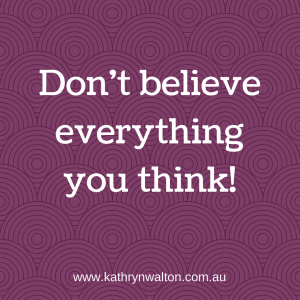 How do you de-clutter your mind and organise your thoughts? 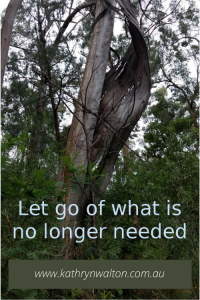 In a world that expects us to be efficient, effective and resourceful, we risk letting go of those things that sustain our energy, health and creativity. One of these things is time spent in nature. Here are 8 reasons why time spent in nature is never a waste of time. We live in a world that expects us to deliver outcomes and meet deadlines. 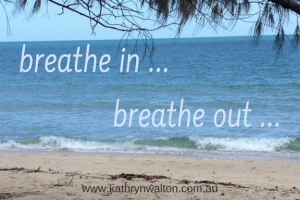 We have constant pressure to be productive and to not waste time, energy or resources. Many people feel increasingly stretched and strung out with our outcomes-based society. Nature provides a sanctuary from the pressures of modern life. When we step outdoors into the forests, mountains, deserts, beaches and waterways, we immerse ourselves in a bigger world. We are at play, not at work. Brains are like busy factories mass producing thoughts, decisions, predictions, reflections, assessments, judgements, assumptions and beliefs all whilst keeping our hearts beating and our lungs breathing. There’s a lot going on inside our heads whether we realise it or not. Getting outside into some green space gives your brain a much needed break from the type of thinking it does all day. Nature is a trigger for your brain to switch modes and operate on a different level – a bit like a mini holiday! When we’re busy we tend to cut back on things that seem less important or urgent at the time. Usually this means we cut ourselves short on self-care. We run ourselves into the ground working harder and faster whilst putting less priority on how we are going to sustain the pace. Half an hour outdoors can be enough time for your mind to begin to reset and for your body to feel re-energised. It’s an investment you can’t afford to miss. Modern life runs at a pace requiring us to be thinking and doing multiple things at once. Research shows this isn’t necessarily the most efficient (or joyful) way of living. 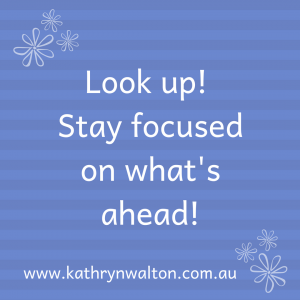 When we focus on one thing at a time, we tend to operate more efficiently and effectively. Although it might feel slower because you’re used to being in the fast lane, it’s actually more productive in many situations! 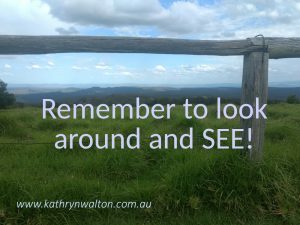 Regular time in nature can teach you to bring your attention to your immediate surroundings. This helps you to let go of your stresses, gently engage all your senses, and refocus your attention when you’re back in your everyday routine. 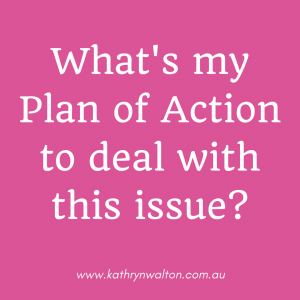 Do you find yourself reacting to a pressured lifestyle by working even harder, hoping that when you get to the bottom of your ‘to do’ list you’ll be able to relax? Sorry folks that isn’t a strategy that is sustainable over the long-term unless you give yourself regular breaks to slow down and switch off. Your ‘to-do’ list will never go away. There will always be something else that demands your attention. When you prioritise time in nature, you learn to slow down – in a good way. Your brain has a much needed rest and you come back to your ‘to-do’ list with a fresh perspective and new energy. You don’t have to be an artist to appreciate the special gifts that nature has on offer. Any one of us can savour the creativity and innovation that often comes with time spent in nature. Perhaps it’s associated with the opportunity to slow down and refocus, I don’t know for sure. But what I do know is that some of my best and most successful ideas have come to me when I’ve been out walking or riding. 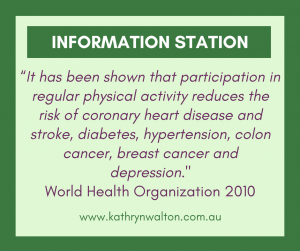 A major contributing factor to chronic disease, including depression, is inactivity. Nature is the natural antidote to a sedentary lifestyle. With so much space to stretch out and explore, so many wonders to be discovered, so much fresh air to breathe and trees to hug (well, maybe that’s just me), what more incentive do you need to get out and get active. Have you ever gone in search of the perfect time management technique, tool or app hoping to be rescued from the stress of managing multiple roles and responsibilities? Despite the numerous time management tools available to us, time management is actually all about managing YOURSELF, not time. If you really want to improve efficiency and effectiveness, invest part of your day, everyday, outside in nature. 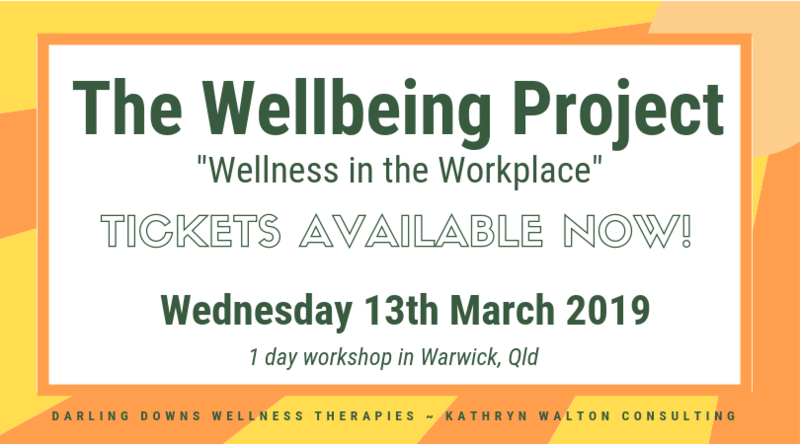 If you’ve read all the other reasons why time spent in nature is not a waste, then it will be obvious to you that it’s one of the best investments you can make to improve your effectiveness and efficiency at work, home and in your relationships with other people. My First Overnight Hiking Adventure! 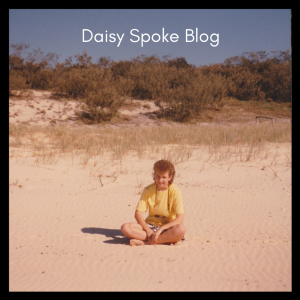 Daisy Spoke has started some new adventures! 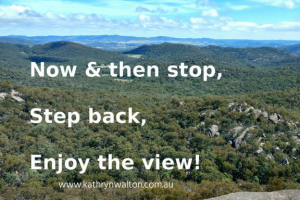 Here is Episode 2 of The Great Backpacking Adventure in which I turn to overnight hiking to learn more life lessons through an outdoor adventure lifestyle – GIRRAWEEN HERE WE COME! Being a year that I’ve devoted to adventure, I’ve been consciously seeking opportunities to push myself out of my comfort zone and expand my inner world. A life of adventure is so much more inviting than a life of being limited by fears and self-imposed routines. So I found myself, rather surprisingly, publicly announcing my intention to have a go at overnight hiking, an activity that in the past has always brought the question to my mind “Why?” I mean, backpacking never really made much sense to me – deliberately burdening yourself with a heavy weight on your back, being completely self-reliant in every aspect, and ….. (and this is a big issue …..) not having access to showers and toilets! Honestly, why would you do this? Where is the fun factor in that? Well, funnily enough, on my life-long journey of self-discovery I’ve come to see that it’s very often the really tough stuff that gives me that sense of being fully alive, an elated feeling that comes with achievement and pushing my limits, rising to a challenge and then reflecting on how I’ve grown because of it, and bringing about a sense of fun. Was backpacking the next big challenge I needed in life to learn to let go of the excess physical and mental stuff that I’ve become attached to, and develop independence and self-confidence in who I am? I started to realise that the stories I’d been telling myself about backpacking, were simply stories; not factual stories at all – simply fiction, made up in my mind keeping me small and stopping me from having a go at something that might turn out to be fun after all. And so with my public announcement of my overnight hiking goal, I began to get myself organised. I decided to share my experience here because I want people to know how valuable goal-setting can be; that we can learn so much more beyond what we expect; and that sometimes goals are uncomfortable, sometimes we lose our way, sometimes we change direction or even miss our target altogether. 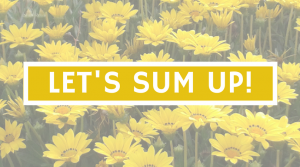 With goal-setting comes a fear of failure, of not being good enough, a fear of giving up – issues I’ve been working on for myself over the past few years, and now here is my perfect chance to put it all together and see what I can do! First started the research – reading and watching books, blogs, vlogs and videos. I began asking questions of others, looking in hiking stores, talking with family and friends about the idea. And pretty soon my goal began to take root and blossom. Yes there have been many doubts and worries along the way, but I knew I was doing this for me. To be the best me I can be, to learn from going through the process even if I didn’t like it and even if I decided not to go through it again. I never said I had to like overnight hiking or keep doing it. I simply said I wanted to try it on for size and see how it fitted for me. 2nd Step – Skills Development! Secondly I embarked on a project to prepare myself with skills to become more bush-savvy. I participated in an introductory and then an intermediate level navigation and trekking workshop for women. Wow, this was amazing! 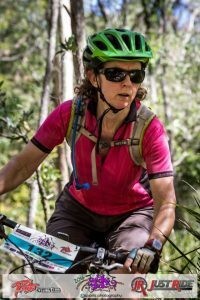 So many other women of all ages, immersing themselves in a lifestyle of outdoor adventure, choosing to skill themselves up and push their limits! 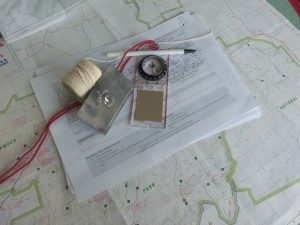 Knowing I was not alone was as important as the actual navigation skills I gained from the workshops. Finally, with all the right conditions in place – fine mid-season weather, a committed crew of family, a convenient vacancy at the dog boarding kennels for little Tommy, no bushfires, no sickness or injury that would prevent us from going (although it was definitely touch and go for a while! 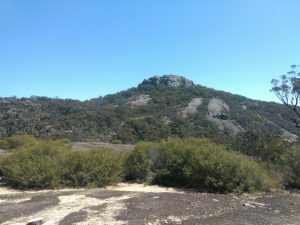 ), school assignments done and dusted for the term – we set off for Girraween National Park. This is one of my favourite places to retreat to. Being not far from home it’s kind of like my other backyard. We had planned our adventure to be a gentle introduction to overnight hiking. We chose marked trails in a National Park we were familiar with so we knew we wouldn’t get lost and would have easy access to help if we needed it. With minimal travel time, low chance of rain and a fairly short distance to walk, we were pretty sure we’d survive the weekend and be home in time for dinner on the Sunday! Hauling our packs onto our backs at our starting point on Saturday was pretty daunting. I was having serious doubts about my very sore foot that had been under treatment but it had flared up again. I groaned under the weight of my pack and secretly feeling nauseous at the idea of what I’d gotten myself into. But we set off, slowly plodding along the established trails stopping regularly to soak in the beauty all round us. 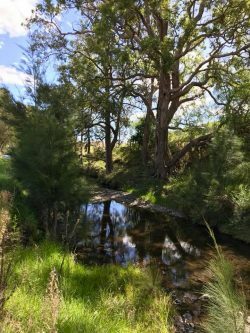 Only a few minutes into our adventure we saw a big shiny red-bellied black snake slithering gracefully through the undergrowth – a reminder to stay alert at all times. We walked 14 kilometres on Saturday at a leisurely pace, munching on homemade protein balls, trail mix and wraps whenever we were hungry. From Underground Creek past West Bald Rock and onto the Stone Cottage, we felt like we were in our own little world. We set up camp in the late afternoon feeling somewhat weary but cheerful. I had pre-cooked our dinner, a result of choosing not to invest just yet in a lightweight stove. It always amazes me how good the most basic food can taste when you’ve been physically active all day. Watching the sun set and the moon rise was a perfect end to our day as we crawled into our tents to sleep. But oh! the fun and games of getting those inflatable pillows ‘just right’! Morning brought us slowly to our feet, still aching from the day before. With time to potter around the campsite exploring our surroundings we gradually wound ourselves up for more walking. 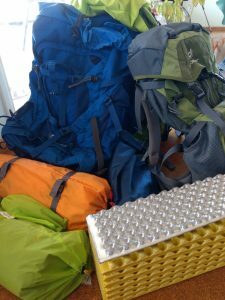 Having consumed most of our food and much of our water, we were relieved to haul our packs on our backs again and find the weight much more agreeable. As we walked along the Peak and Creek Trails we were fascinated to see how different everything appeared compared to when we’d ridden our mountain bikes through here. 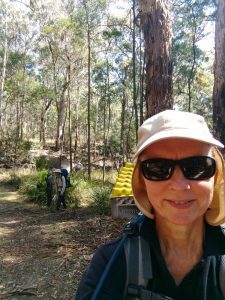 We chatted with some other walkers along the way and arrived back at Underground Creek for lunch, a pretty easy 10 kilometre stroll along gently undulating terrain with spectacular views of Mt Norman, other granite structures and an array of spring wildflowers. 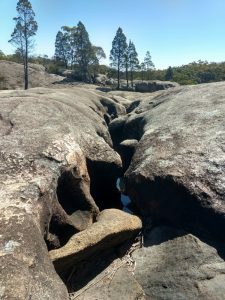 I’d read stories about crows and currawongs pilfering bushwalkers’ backpacks, and was astonished to be caught out myself when I put my pack down to explore the marvellous formations of a granite outcrop. 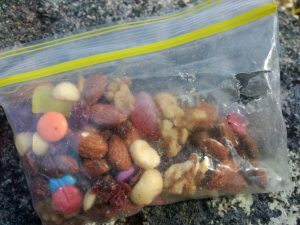 My trail mix was the object of its fascination, tearing into the ziplock bag through the side mesh pocket on my pack. A pretty obvious lesson learned! What! Is it already time to go home? Our weekend adventure seemed to be over all too soon. We couldn’t bear to think we’d have to get back into the car and drive off when it felt like we had only just begun! 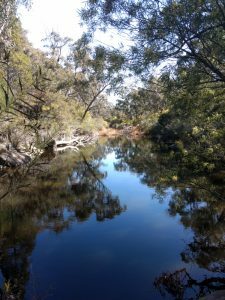 So we sauntered down to Dr Robert’s Waterhole and gazed at the reflections in the water for some time, extending our time as long as possible. I wonder what adventures the First Nations People have had in this stunning landscape, and what adventures other hikers, landowners and picnickers have had here throughout time as well. We knew right then that our overnight hiking adventure was just the first episode in a whole new series of adventures for us. The doubts, the lack of toilets and showers, the physical and emotional challenges were not going to keep us living a small life. Bring on the next adventure I say! 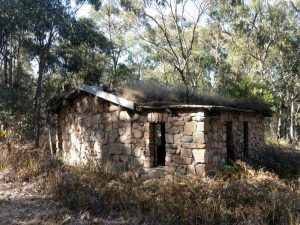 Posted on October 3, 2018 October 19, 2018 Author kwwpadminCategories Active Lifestyle, Life, The Great Backpacking AdventureTags achievement, adventure, adventurous life, appetite, attachment, aware, backpack, barriers, bushwalk, bushwalking, camp, camping, challenge, cognition, compass, crow, doubt, dream, family, Girraween, goal-setting, goals, great outdoors, hiker trash, hungry, lifestyle, limitations, limits, mindful, mindfulness, national park, navigation, obstacles, outdoors, overnight hike, overnight hiking, research, rucksack, self-confidence, self-doubt, snake, success, tent, thinking, thru-hiking, trail mix, trekkingLeave a comment on My First Overnight Hiking Adventure! Welcome to Episode 1 of The Great Backpacking Adventure in which I turn to overnight hiking to learn more life lessons through an outdoor adventure lifestyle. My best memories and my best learning about life have come from spending weekends and holidays in the great outdoors. 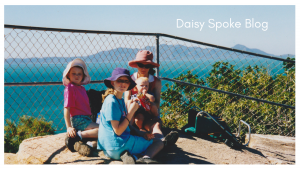 As a child my parents whisked us away for family holidays in our caravan or tent, taking in wonderful adventures as we immersed ourselves in some of Australia’s most iconic landscapes. We took walks in the grandeur of rainforested mountains enthralled by stories of our ancestors’ pioneering days. On secret secluded beaches we discovered ocean life washed upon the shore – evidence of another world we could barely begin to imagine. Across the deserts we drove, soaking in the wonder of the sunrises and sunsets, a land of extremes in myriad ways. 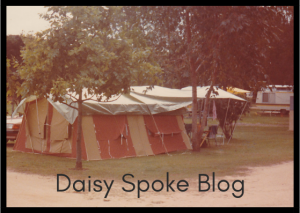 My teenage years brought the opportunity to go camping with my Girl Guide and Ranger crews. As a restless sleeper, I knew then that my best sleeps came after a day in the outdoors, hiking, learning woodcraft skills, cooking over a campfire, canoeing, kayaking, abseiling, riding bikes and simply being with others who loved the adventure as much as I did. 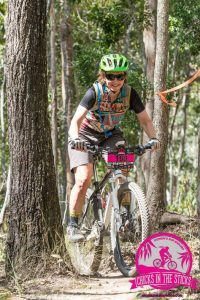 It was no surprise then that at uni I met and married a kindred spirit of the outdoors. 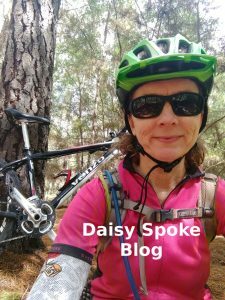 We spent our leisure time exploring all the usual National Parks trails within a few hours drive of the city, playing frisbee in the park, cycling the local roads and pathways, paddling on the bay and local creeks, and filling our lives with regular camping trips near and far. As our children arrived on the scene, they too were included in our adventures which were modified to accommodate their growing needs. Nurturing their love of the outdoors has been one of the most rewarding experiences of my life so far. To see their little faces eagerly joining in on walks, creek paddling and bike rides has been completely heartwarming. And to hear their excited voices asking questions, always asking questions, soaking it all in, enthusiastic about nature and adventure, curious about their world and seeing themselves as a valuable and integral part of it has been a spirited journey. Through family illness and injury, study stresses and sporting commitments, work pressures and ties to family, friends and farm animals, we’ve kept up our habit of spending much of our leisure time in the great outdoors. Sometimes our adventures have been confined to the backyard (albeit a sizeable acreage of dry bushland) because that’s all we could do at the time. 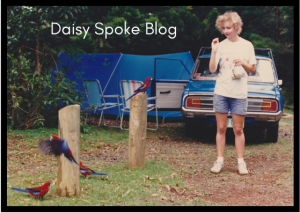 However sometimes our adventures have taken us to amazing far off places – interstate road trips with the trailer packed to the brim with camping gear. 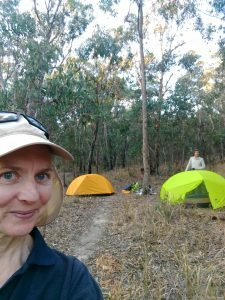 We’ve camped and hiked in awe-inspiring places like the The Warrumbungles, Mt Kaputar, the Blue Mountains, Carnarvon Gorge, Atherton Tableland, Central Australia, Birdsville, Innamincka, Gibraltar Range and Sturt National Park. By the time Miss E reached high school, she’d spent more birthdays in our tent than she had at home. And now this year I sensed I was ready to take on a new challenge. 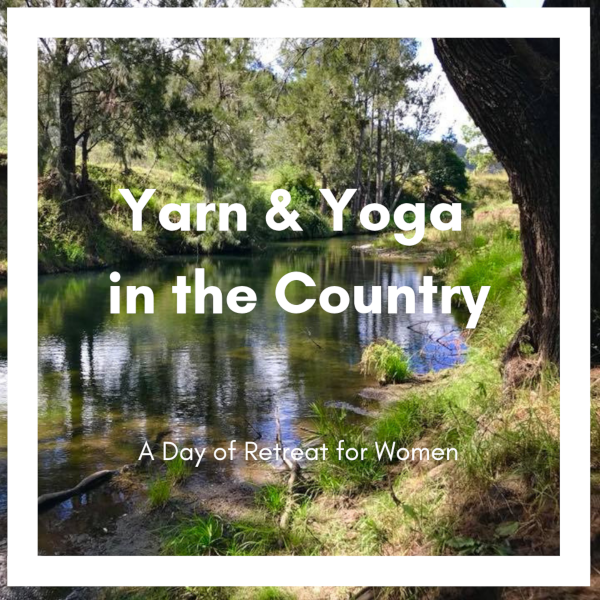 A challenge that would combine my much-loved experiences of camping with the physical challenge of bushwalking – I decided that this year I was going to have a go at backpacking! Something I was never interested in at all until now. I mean, why would you want to carry a heavy weight on your back for hours to a campsite when you can so easily tow a trailer with everything you could possibly need (and more), and pull up right beside a campsite to unpack, in easy walking distance of the bathrooms, and with plenty of walking trails to choose from right where you are! But the inner self doesn’t always operate on logic, and I’ve learned to trust myself when I sense that I’m ready for something new. Back-flipping my thinking didn’t come easily though. I’ve done a lot of soul-searching and asking myself “why?” and I don’t really have that answer yet. 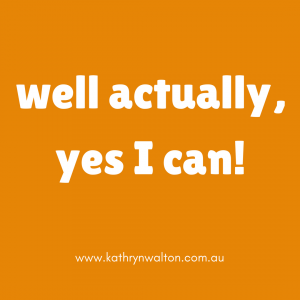 But what I do have is a strong pull towards challenging myself, stretching my abilities and coping skills, and discovering new possibilities for myself, not limiting myself. Surprising as it may seem, even to me, the life learning in this backpacking adventure has only just begun! Stay tuned for my next episode of My Great Backpacking Adventure as I take off on my first overnight hiking expedition! There’s no doubt about it, a good night’s sleep can make all the difference to how we feel and how well we function. 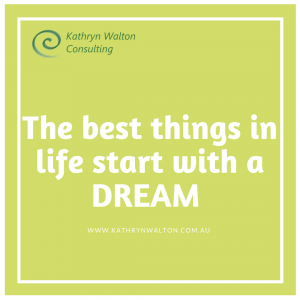 In this article I share my top ten tips for a better sleep. Sleep is a vital ingredient for physical and mental wellbeing, yet 33-45% of adults report having inadequate sleep*. The consequences of poor sleep are not just cosmetic (“Oh gawd, look at the dark circles under my eyes!”). Of more serious concern to the individual and the whole community are health problems, worker safety and performance, and risk of motor vehicle accidents. The research tells us there are many factors that affect sleep quality and quantity. Now everyone’s different and some of us are more sensitive to some of these factors than other people. It’s not a black and white science that we’re dealing with – many of the studies have been done in clinical settings (not in the home) and have tested for more extreme conditions of one factor at a time, rather than a mixture of different factors that we’re more likely to experience in our everyday lives. Sleep is a complicated process. 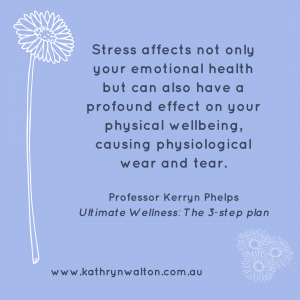 The cause and effect is not always direct and clear, so what seems helpful at first glance (for example drinking alcohol or smoking before bed), may actually be masking the issue (such as stress and anxiety). So part of the trick to getting a good sleep is getting to know yourself first including what’s most likely to help and hinder your own situation. The research base is a great place to start experimenting to see what conditions work best to give you a refreshing night’s sleep. If you don’t feel safe, have a chat with someone you trust, or your doctor or a counsellor to develop a plan to feel safer. Substances such as caffeine (think coffee, chocolate and energy drinks), alcohol, tobacco and other drugs may bring a temporary feeling of relaxation, but they can also disrupt hormone production, sleeping rhythms and other health issues. Likewise, your eating habits may have an impact on your sleep. Avoid spicy foods if this causes discomfort and avoid large meals and drinks at bedtime. There is some evidence that certain foods might help you sleep better – wholegrains; some nuts, fruits and dairy foods; and caffeine-free tea. Chat with your doctor or health practitioner if pain is preventing a good night’s sleep. Pain is a complex phenomenon with a wide range of causes. There are many different pain management techniques to choose from – find out what works best for your overall health and wellbeing. Some medications can make you feel drowsy, and others can make you feel more alert. Check in with your doctor or pharmacist for advice on anything to do with medication. In my professional (and personal) experience, one of the most effective ways to improve sleep is to increase your exercise, especially in the morning. Moving around throughout the day and reducing how long you are sedentary for is also helpful. Some people find it helpful to have a short nap during the day, but later in the afternoon may disrupt your night time sleep. Get yourself some morning light. This triggers the production of melatonin, a hormone responsible for your inner body clock – you’ll feel sleepy when it gets dark in the evening. Despite many people using TV and devices just before bed or even while they are in bed, the type of light they emit and the stimulation they provide can really impact your sleep. The recommendation is to turn devices off an hour or so before bed and don’t take them into your room. Manage your daytime stresses so that you’re not holding that tension when you go to bed. Learn body relaxation techniques as well as mind relaxation techniques. Mindfulness training is particularly useful. If you’re locked into a vicious cycle of insomnia, it can be helpful to have some cognitive behavioural therapy sessions to power up your thinking and make positive changes to your sleep. Find an evening routine that’s helpful and then follow it. This might take some experimenting to see what soothes you and what stimulates you. Make your routine a habit, and remember that it can takes weeks of adjusting to a new habit or routine before you see the full results. Are you comfortable in bed? Is it too hot or cold? Too soft or hard? Noisy? Smelly? Too light or too dark? Is it relaxing and comforting? Avoid doing work or studying in your bedroom as this can build an association with a wakeful or stressed state. Are you responsible for the care or wellbeing of other people, livestock or pets through the night? If possible share your caring responsibilities with someone else so you can take turns at sleeping a bit longer, or a bit better. So there you have it – my top ten tips to improve your sleep, and the best thing about it is you can start experimenting right away! If your sleep doesn’t improve after trying these strategies, make sure you have a chat with your doctor. There are some medical and psychological conditions that may need more specialised interventions to get you the super sleep you deserve!